It is the duty of every government to help its people and protect their rights in a democracy. Punjab government has always made the convenience and rights of its citizens a priority. To serve them fully, the state has initiated a series of helplines. This is a go-to zone where citizens can report their grievances to the government and / or its respective departments and expect speedy redressal. This responsive initiative by the government secures citizen’s faith and trust. At this time, many functional helplines are working effectively in Punjab. Let us explore such helpline services and their functioning for the betterment of Punjab’s citizens. 181 Police Helpline – 181 helpline is conceived to support and help the women in distress. This one-stop call assures women with speedy relief in emergency conditions like eve-teasing, stalking, violence, emergency medical treatment. The service is the ‘need of the hour’ to empower its women folk with government support. 181 helpline in Punjab has been instrumental in generating positive response among women. This can be judged from a simple fact that they are using this service to gain counselling on problems. At times, they call the helpline, share their problems and find a perfect resolution to their stress. In all, this great service has built a positive response among Punjab’s women. NRI Helpline – NRI’s form a great part of Punjab. There are thousands of Punjabi NRI’s who are bringing laurels to the state with their achievements and success. The state acknowledges the role played by the NRI’s in its development and has therefore initiated a special 24×7 hr helpline – 0091-172-2298543 to facilitate their issues easily. The purpose of the helpline is to expedite the queries and grievances by the NRI’s pertaining to land disputes, money fraud or cheating. Water Supply and Sanitation–Punjab is the land of immense water resources. To help the citizens report and resolve water supply issues, the state government has rolled out India’s first-of-its-kind toll free helpline. Calling on the helpline number 1800-180-2468 will not just expedite the water supply and sanitation services , but will also help its citizens keep a check on government services. Till date, the helpline has drawn good response and the state is enthusiastic about its performance in the coming years. 1912 Powercom– The state electricity board, Powercom has launched a helpline to support the citizens and ensure to expedite response on their power complaints. This IVRS helpline assures power / electricity consumers in the state. Excise Helpline – To make excise and taxation procedures easy for a thriving business in Punjab, the state’s Excise and Taxation Department has launched a toll free helpline – 18002582580. The helpdesk functions from 9AM to 6PM and ensures adequate redressal to the taxation escalations. Here, the citizens can ask about the legalities behind taxation structures like VAT, CST, Excise, Entry Tax and Luxury Tax and gain insights to manage their business decisions in Punjab. The helpline numbers have been initiated to empower the citizens and ensure an effective 2-way communication channel with the governing authority. With focus on state’s development, Punjab Government is now paying attention to skill development in the state. Government has already advocated imparting of technical education and vocational course. However, now the government is supporting ‘State Skill Development Missions’ across the country. These missions will help in better skill development and management across India. S. Parkash Singh Badal, Punjab CM, has expressed his support for the missions saying that they should be made nodal points for convergence of skilling initiative for optimum utilization and its three tier de-centralization at the state, district and block level. Also, he advocated the involvement of panchayats, Municipalities and civil society organizations in steps to mobilize skill aspirants. Highlighting the importance of skill impartment, S. Badal said that it was time to give Right to Skill to every youth in the country. Mobilization of private sector is very necessary for this purpose. Further, country needs opening up of National Skill Development Council and Sector Skill Council Chapters at the state level or the regional level for better co-ordination. The government is taking appropriate steps to begin the development at root level by promoting vocational education at middle school level. Besides, there is need for states to introduce local and traditional skills as part of such courses to make the youth ready for entrepreneurship opportunities available in their region. Giving training to youth in the fields of healthcare, local trades, crafts as well as agrarian and animal husbandry related occupations can give a major push to skill development. Many states in the country are facing shortage of instructors and trainers and the Chief Minister has said that special focus will also be on creating a pool of efficient trainers. For the purpose, it is being suggested that the Skill Universities should be given the responsibility of making the trainers ready. Recommendations are being made to achieve the target including earmarking at least half of the Corporate Social Responsibility (CSR) funds for skill development activities, levying a cess for skill development for creating a non-lapsable pool and thirdly, use of building & construction welfare fund, CAMPA fund, state mineral fund, MPLADS/MLA in skilling. Data suggests that India needs to provide skill training to 10.9 crore new entrants to the job market and around 46 crore people to be re-skilled and up-skilled by 2020. To make India economic super power, it is necessary that every youth in the nation is trained in certain skill and that he/she proves to be an asset to the country. Punjab Government seems to be focusing a lot on value of education as, on a recent 5th World Education summit, Punjab Education Minister Dr. Daljit Singh Cheema emphasized on the need to change the existing education system to make it in line with ground realities and the need of the people of the state. As a matter of fact, present education system suffers from a few flaws and there is an urgent need of promoting quality education that may actually benefit the lives of people. The RTE Act 2009 was formed to streamline the education system but it also came with a few shortcomings. These include not failing the student till 8th class and scraping Board examination for 5th and 8th classes. These flaws need to be rectified but this can only happen if states raise voice for the same. Also, the government is laying stress on the need to strengthen primary and vocational education. It is only the primary education that lays the basic foundation upon which a student builds his/her academic career. Further, it is being highlighted that a child gets admitted to a government school at age of 6 while the age for admission in private schools is generally 3. There is an immediate need to standardize the pattern and set an equal minimum age for admission. While forming such policies, the interest of the child should be given supreme importance. Also, it should be made sure that the people get education at affordable rates. The education they deserve shouldn’t be out of their reach due to financial matters. Other than the flaws in policies, the government is keen on developing a system where quality education is imparted that actually uplifts the standard of lives. Quality education and job-oriented courses should be introduced to ensure that no student faces unemployment after completing education. Vocational courses and practical education needs to be promoted to meet the industrial needs. There is need for policy makers, planners in the field of education, teachers and parents to come together and help in building a robust education system which will strengthen the existing one. To improve water and sanitation services in the state, the Punjab Government has taken a huge leap by assigning Rs. 2200 crore to the ‘Punjab Rural Water & Sanitation Sector Improvement Project’. The move is aimed primarily at providing the people in every nook and corner of the state with basic and necessary amenities. The target is to make the state open defecation free. The government has been focusing a lot on healthcare in the state and this move can be said to be an extension of the same. Under the project, the government is committed to provide all the households with a toilet and a water connection within three years. At present, under the existing rural water supply schemes 40 litres per capita per day (lpcd) water is made available to the consumer. However, the government has proposed to increase the same to 70 lpcd. With the development, Punjab will become the first state in the nation to achieve the prescribed norm for potable drinking water at par with international standards. A sum of Rs. 300 crore has been set aside to provide treated water in all villages of Punjab including 121 villages of Moga and Barnala districts with affected water quality. Officers are being asked to ensure water supply in each and every household and issue a certificate for the same. The ongoing development in the field is constantly being reviewed by the government and the villagers and panchayat members are being contacted on regular basis to monitor the progress. Regarding the construction of streets, the government has instructed to construct the streets only after work of water supply is completed. Construction of toilets in villages is also given special attention and it is being made sure that the people in villages have access to adequate number of toilets. With an aim of overall development of the state, the Government of Punjab is working day in and day out and making sure that people have access to basic amenities. Further improvement of living standards in Punjab is also being focused upon and the people witness launch of new development projects every day. The reflection of effective governance in Punjab can be easily seen by the number of “Common Service Centre” or “Suvidha Kendras” opened by the government across the state for the convenience of people. These Kendras are multiple-services-single-point representation for availing amenities for multiple transactions at a single geographical location. The prime intention of these centres is to provide a physical facility for delivery of e-Services of the Government of Punjab to the rural and isolated locations where availability of computers and internet is currently nil. This would help the citizens of the state to avail basic amenities in a hassle-free manner. These Suvidha Kendras across the state are Gram Suvidha Kendra, Saanjh Kendras and Fard Kendras. We can’t deny the complexities that agricultural value chain in the state has to face. In order to ease the complexities, the government is working effectively to weed out spurious inputs, lack of storage facilities, and high number of intermediaries that add on to subsequent margins without adding any value to the produce. To guarantee citizen-centric services in the rural areas, Punjab Government has decided to set up 3037 e-Gram Suvidha Centres in the villages across the state at a cost of Rs. 90 crore. The delivery of old-age pension, registration of pension for handicapped and widows and disabled persons is monitored and ensured by these Gram Seva Kendras. These centres have been set to ensure various welfare schemes besides various citizen-oriented services in a hassle free and competent manner. This project was started in 2010 in the state as a partner initiative between the community and police. It is said to have extended the concept of community policing centre, up to sub-division and police station level. More than 500 Saanjh Kendras have been implemented in the state. The main motive to start this project was to provide services to citizens immediately leveraging the state-wide IT platform. This project has computerized upto 51 million land records across 36 districts in the state. The government has by now computerized all types of land records like Jamabandi, Roznamcha waqiati and Mutation. Jamabandi Records include the Khasra and Khatauni of the lands. This digitization of land records has benefitted the land owners as well as the revenue department. Owners can now get the nakkals of their land records on the spot from any Fard Kendra or even access them online. This has brought in transparency between the revenue department and the land owners. This e-governance revolution is not only going to address important issues like enhancing facility experiences, but will also help in curbing corruption to a certain level. The e-governance strategy has brought smiles to millions of faces as availing facilities has become easier. The e-facilities installed is another step towards growth and development of the state. Have you ever thought why there’s a need to attest your degrees to process application for a government job or an admission? Why there’s a need to run behind the gazetted officers to complete this process? These cumbersome procedures delay such time-bound applications and cause a lot of confusion and problems to the applicants. Punjab Government has understood such common problems of its citizens and abolished affidavits in April, 2015. This is a state government’s initiative to bring governance reforms for the benefit and convenience of its people. The idea is to implement an affidavit-free regime and bridge the gap between citizens and government. The concept of affidavits owes its origin to the colonial times. The government then required the citizens to declare their qualifications and guarantee their word. But now, this practice holds no relevance as the state government is taking an initiative to support its citizens and helping them with policy reforms. The policy caught government’s attention through statistics captured at the state’s Suwidha Centres. The state government found out that more than 60% of the services were dedicated to the attestation of affidavits. It was evident that both the government and its citizens were experiencing inconvenience due to this burdensome procedure. A lot of resources in terms of time, energy and money were strained on affidavits. A detailed analysis highlighted that the rising attestations were conducted for school and college admission and applications for government services. Needless to say, the procedure caused a lot of panic and inconvenience to the applicants while submitting the deadline based forms. Hence, the Government of Punjab decided to amend the affidavit policies for the benefit of its people. And now, the students and job seekers in Punjab will not have to rush for affidavit attestation as the state government has already abolished the requirements for affidavit declaration. This minimum use of affidavits will shift to self-certification for students and job applicants. The state government has also waived-off the affidavit procedure on 88 services. This initiative has not just empowered the citizens of Punjab, but has also reduced state’s burden. 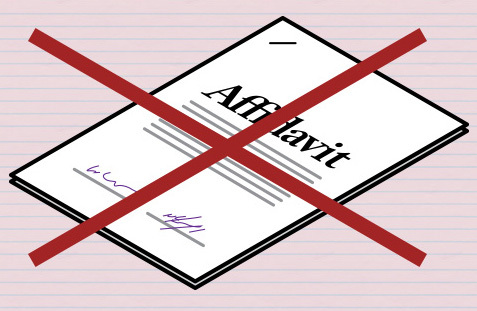 According to the government, the abolition of affidavits will save Rs. 300 Crores. Not only that, it will also restore trust and dignity of its citizens and save them from unnecessary litigation. However, the government has identified 12 services where an affidavit is mandatory as per State & Central laws. The state government has also implemented governance reforms at Government to Government (G2G) and Government to Consumer (G2C) services levels. Punjab has always kept its people priority. To serve them, the state has established Sewa Kendras, Saanjh Kendras, Fard Kendras, Suvidha Kendras and Gram Suvidha Kendras throughout the state. In coming years, the government would also set up 2147 Sewa Kendras in villages to provide hassle-free citizen centric services to people at grass root level. By launching these centers, Punjab Government has reiterated its commitment towards serving its people. Such citizen-centric initiatives have brought accolades like ‘Best Governance Practice’ award to Punjab. All such developments have led the state pave a new era of ‘Reforming Punjab’ on a larger scale. 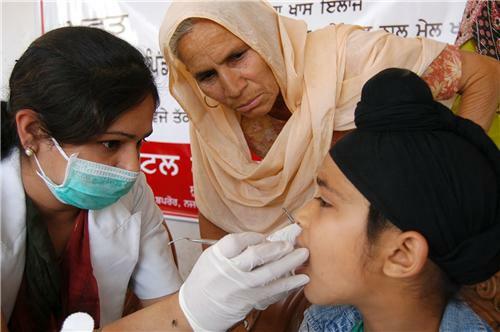 In a bid to change the face of healthcare delivery in the state of Punjab, the government has launched Universal Health Coverage (UHC) project in two blocks, Mukandpur and Balachaur of District SBS Nagar (Nawanshahr), on pilot basis. The project is seen as a huge step in revolutionizing the healthcare delivery system in the state. The success of this project will decide the launching of UHC all over Punjab. The idea behind this is to provide the people will necessary health services without having to suffer financial issues. The project is actively being run in the said block of SBS Nagar. At present, the health workers are conducting the mass screening for diseases like Hypertension, Diabetes, Asthma, Nutrition, Anaemia, Substance Abuse, Cancer (Breast, Cervical, Oral) by reaching out to each and every member of public. This is a step towards early detection of these diseases. To make this a success, the government is training health workers and is also making efforts to provide efficient and well-run health system for the public. These health workers are also trained efficiently to use these diagnostic devices to make screening a success. Mass screening has been completed in 8000 households out of 20,000 in block Mukandpur and 1000 households out of 25,000 in block Balachaur. It is expected to be completed by June 2016. An application has been developed by the government in collaboration with Reliance-Jio Infocomm Ltd., Mumbai to fulfil the requirements under Universal Health Coverage. The data in this application is based on Aadhar database. In addition, each ANM has been equipped with state-of-the-art software loaded tablet and the health facility staffs have been given desktops and laptops to keep the record of patients. Further, under this project a ‘Family Health Card’ has been designed in collaboration with PGIMER Chandigarh which will be used to capture the detail of every member of the family and their medical history. The patients identified by this card shall be eligible to receive either free treatment or at affordable price. Ms. Vini Mahajan, Principal Secretary, Health & Family Welfare, Punjab, is herself tracking the progress of the project. In recent times, Punjab government has given special attention to improvement of healthcare in the state. Previously, a good amount has been invested in improvement of infrastructure of public healthcare facilities. With the UHC project, it may be expected that the state will make historical progress in the field. After the success of the project and the analysis of the same, it shall be launched on a wider scale all over Punjab.